Penguin presents the unabridged, downloadable, audiobook edition of the Work Clean, written and read by Dan Charnas. Night after night, chefs and their crews are able to multitask and produce in a way that puts deskbound workers to shame. 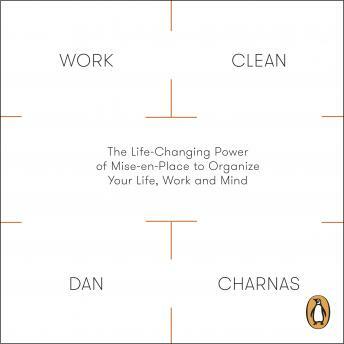 In Work Clean, Dan Charnas uncovers their secret: mise-en-place - the organizational system that transforms the lives of its practitioners through focus and self-discipline. Through interviews with top chefs working in professional kitchens all over the world, culinary students, line cooks and restaurant employees, Charnas reveals the ten major principles of mise-en-place -- including 'Arranging spaces', 'Finishing actions' and 'Slowing Down to Speed Up' -- and demonstrates how they can be used to boost productivity in all aspects of life.